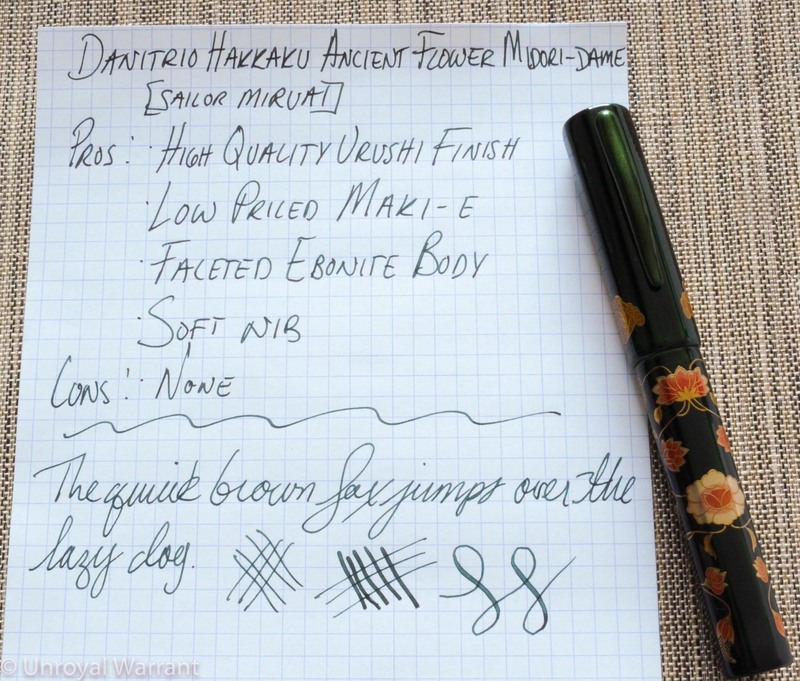 Danitrio is perhaps the biggest name in Maki-e pens outside of the main three Japanese makers (Pilot/Namiki, Platinum/Nakaya and Sailor). Danitrio Maki-e pens are not an entirely Japanese product. The company is based in California and the pens, as far as I know, are manufactured and painted in Japan but use Bock nibs from Germany…so it’s a multinational effort to put one these pens together. I have been eyeing a Danitrio for a while as they offer very good value for money. While they are by no means cheap, they are considerably less expensive than most comparable Japanese pens. 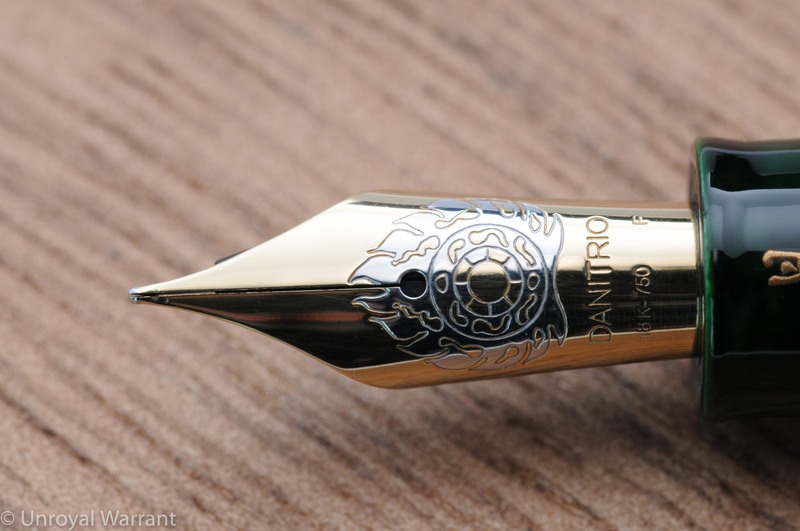 One of the great things about Danitrio is that they offer their pens in a large number of shapes and finishes. Despite having similar dimensions to a Montblanc 149, the Hakkaku is one of Danitrio’s smallest models measuring 13.5cm long and 1.5cm wide. 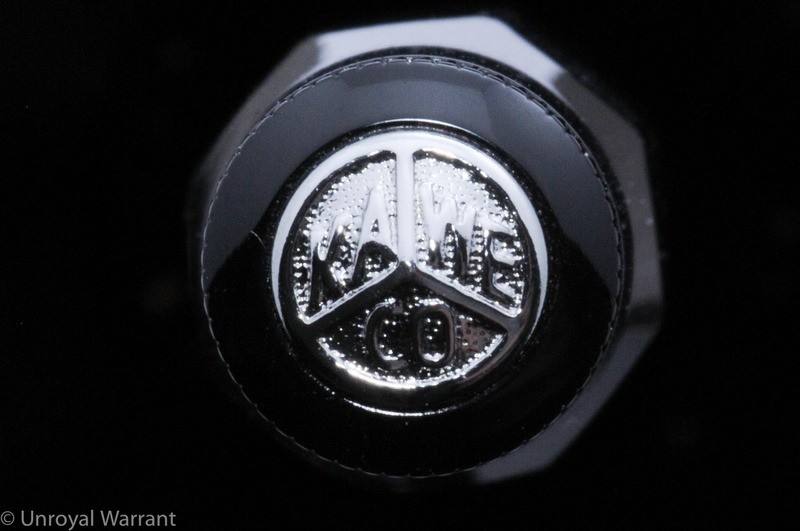 The ebonite body has a faceted flat top design. The dark Midori-dame finish softens the look of the facets. A lighter color would do a better job of accentuating this pen’s shape. 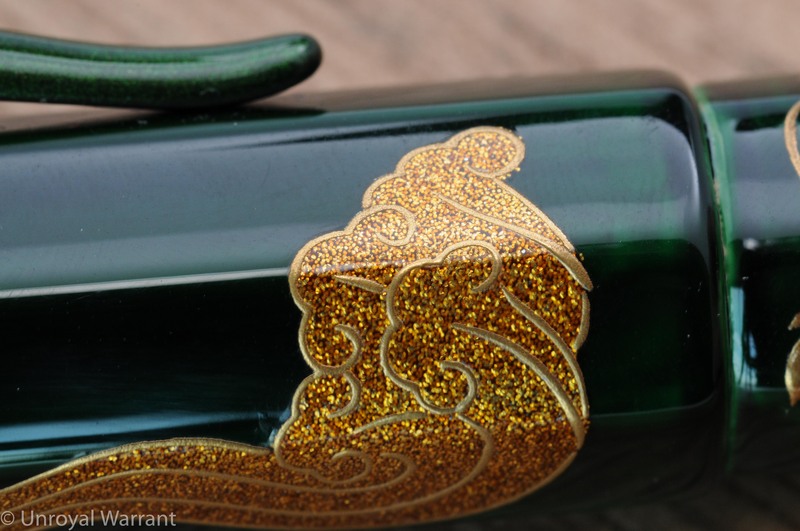 The clip is sprinkled with gold flakes and painted in the same midori-dame finish as the body. I am not a big fan of flowers but I kept coming back to this ancient flower design. It is very well balanced and looks great against the green background. 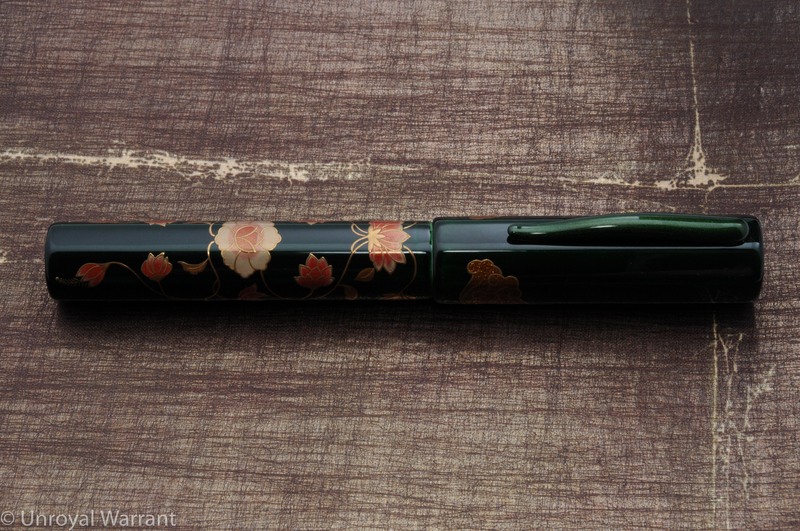 This pen (I am told) uses a Togidashi Maki-e technique. 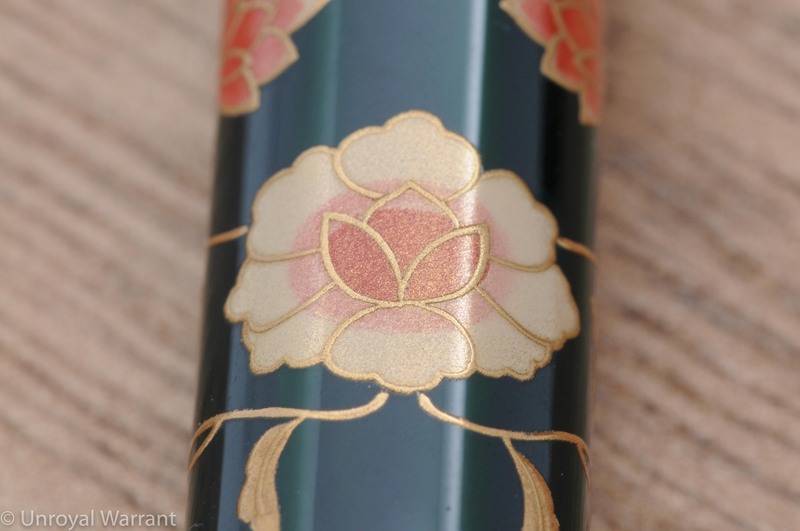 The finish quality of the Hakkaku is comparable to Nakaya. 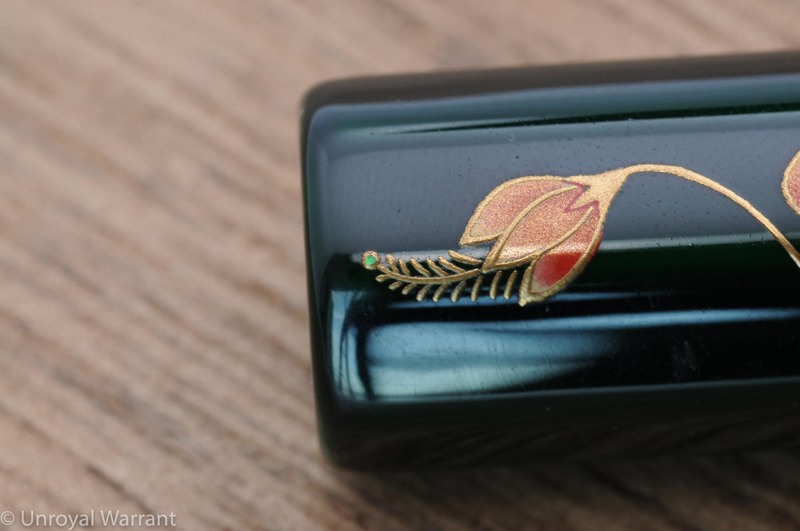 It’s not perfect like a Namiki pen; it has more of hand made look and feel to it. 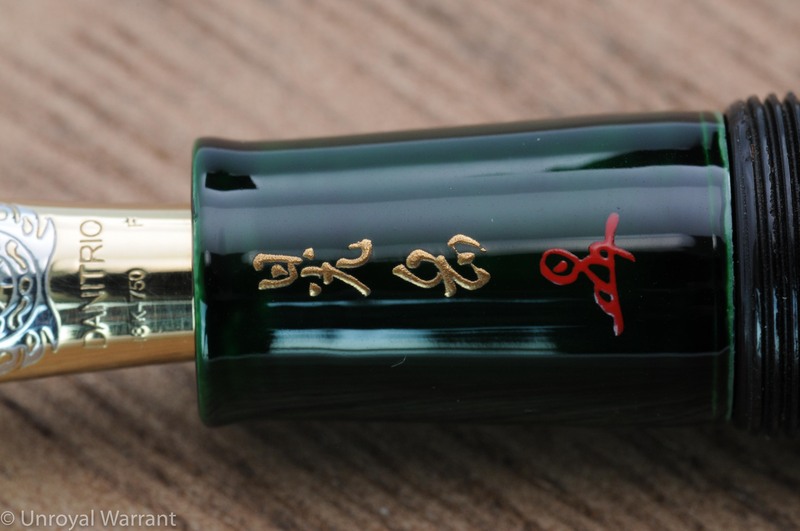 The threading is smoother than on my Nakayas and unlike my Nakaya Naka-ai Negoro the design always lines up when I put the cap on. The section is signed with the artist’s signature. 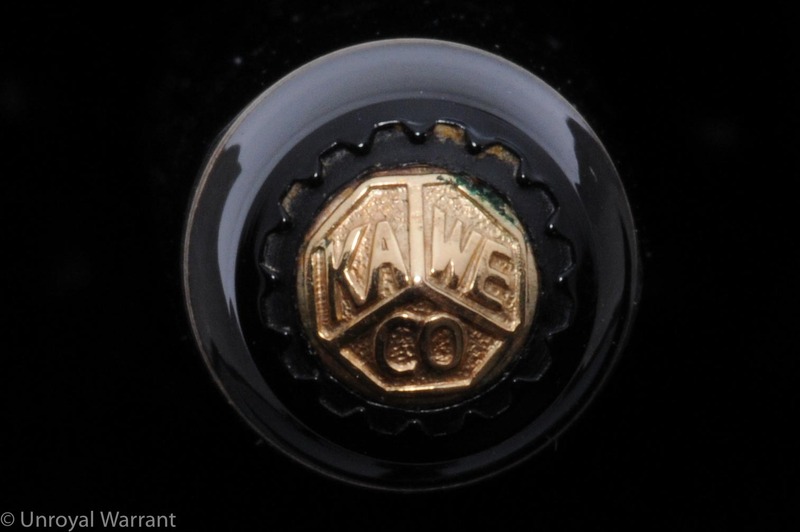 The #6 size nib is solid 18kt gold and produced by Bock in Germany. The fireball design looks great. 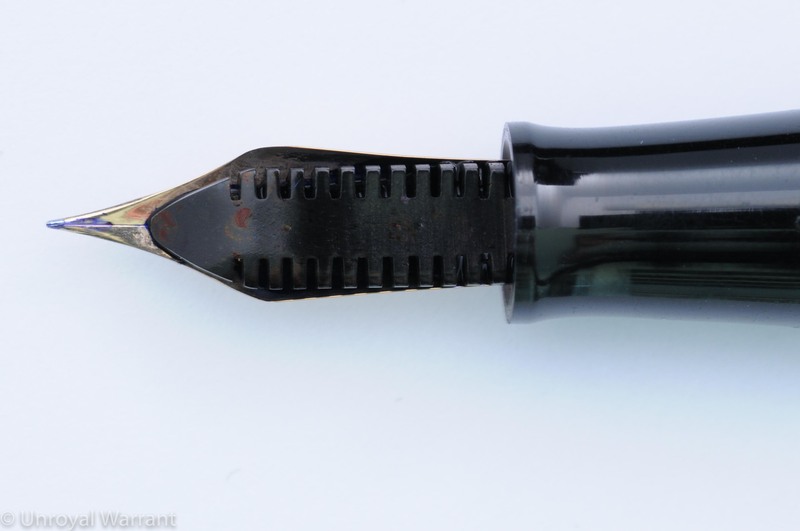 The nib has a fine point and is considered one of their “soft” nibs. The nib is soft and if you apply some pressure you can get some line variation but for me with a light hand I don’t notice much. 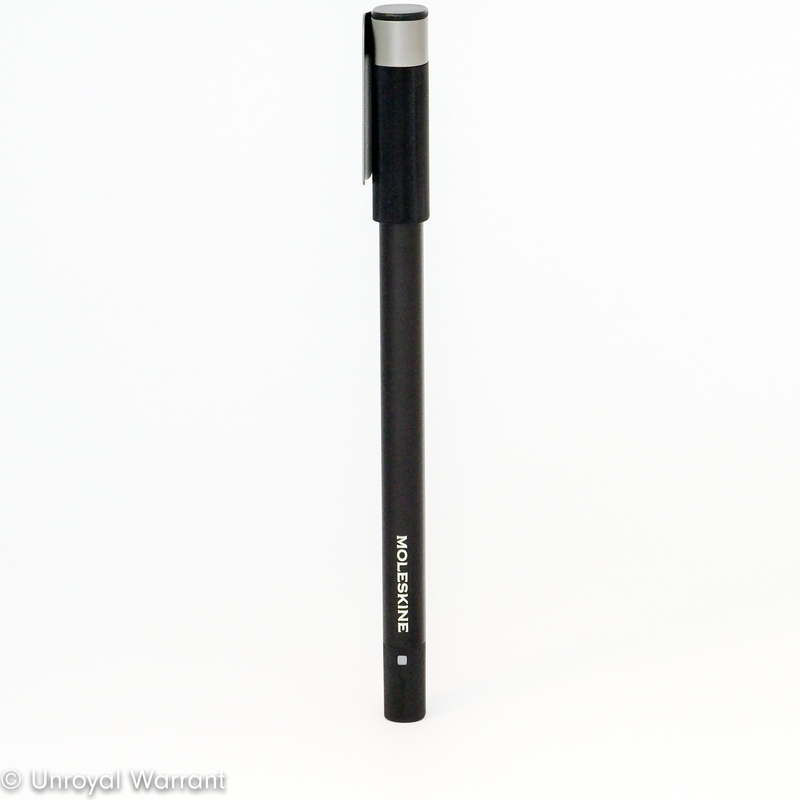 The fine point is smooth and writes with a medium line width (typical Bock). 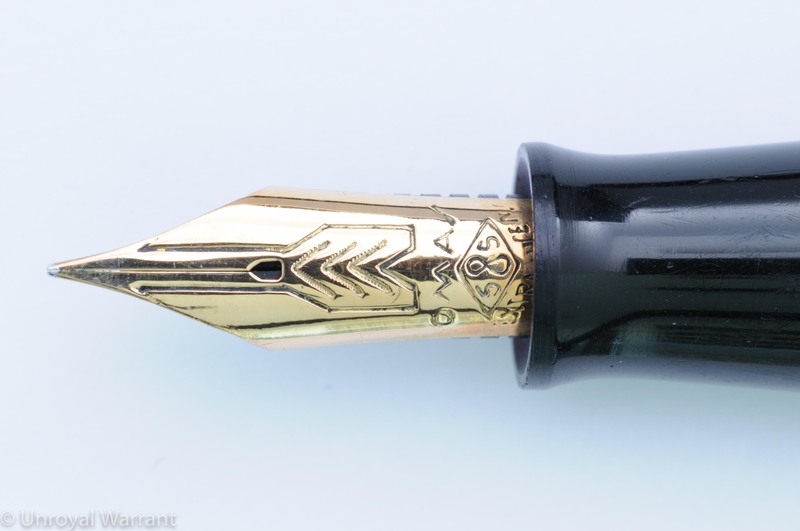 If you want a true fine you are better off with an extra fine nib. The nib doesn’t have as much character as those made by Pilot or Platinum but it’s a good performer and if you like a smooth soft nib this one is very nice. 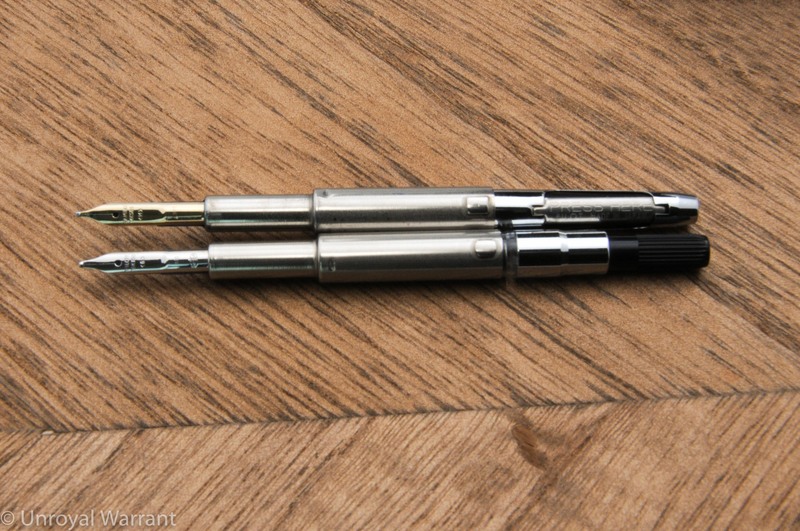 The Hakkaku takes standard international cartridges and comes with a Bock converter. The feed is plastic (and out of alignment, the dealer has since remedied the problem). 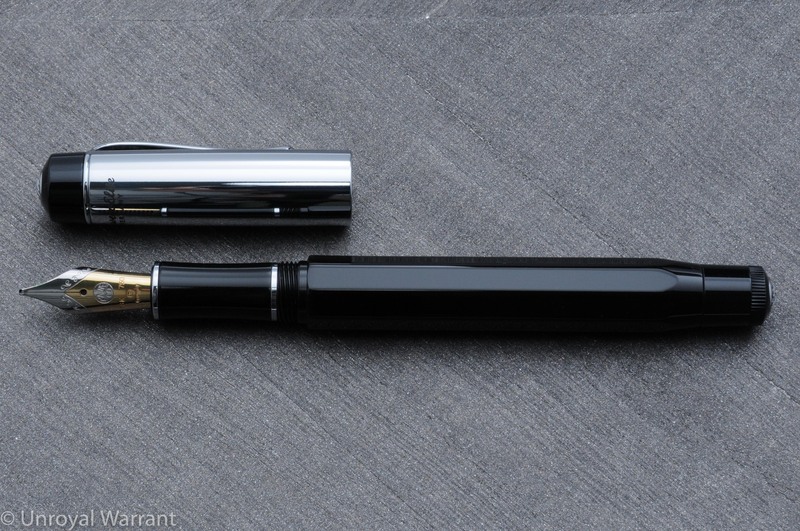 This pen has a retail price of $1,900 and I was able to get it for a bit less than half that. 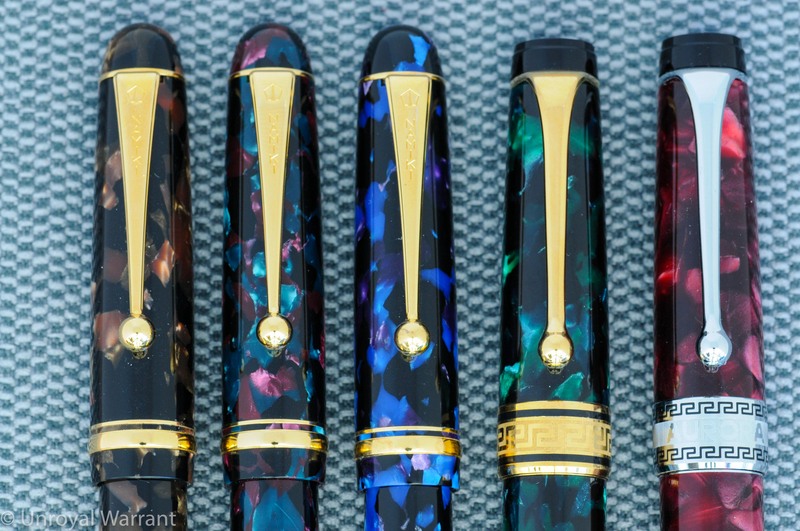 By comparison, a plain urushi lacquer Namiki Yukari Royale runs $1,500 and a Maki-e versions range from about $4,000-$10,000. 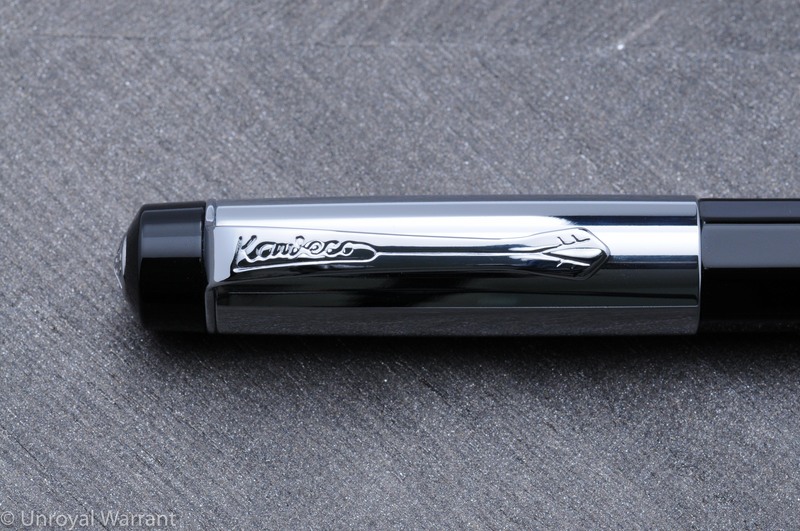 I am not saying this pen is the same quality as a Namiki (it isn’t) but it is a more affordable way to get your hands on a good quality Maki-e pen. At the end of the day I am really happy with this pen. 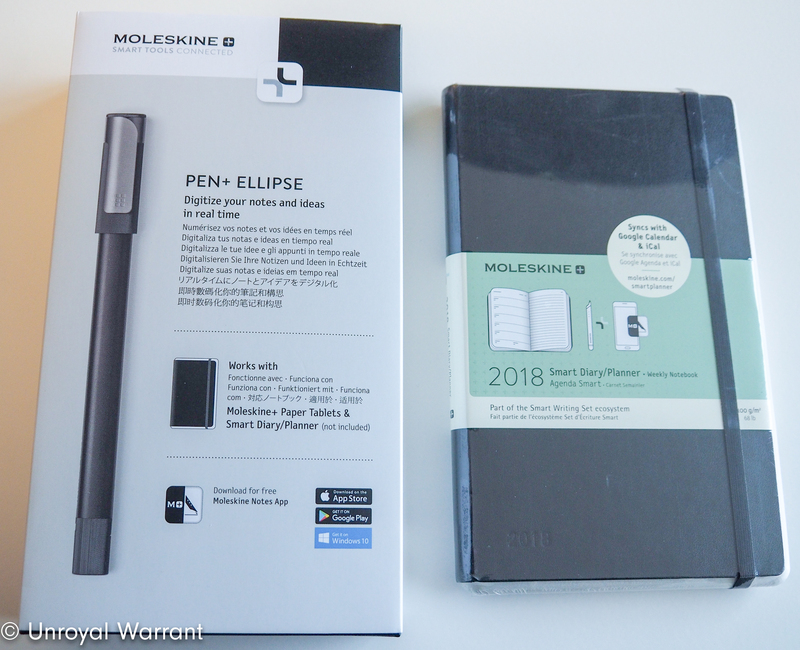 It looks and writes great and it was reasonable enough that I don’t worry about using it everyday. 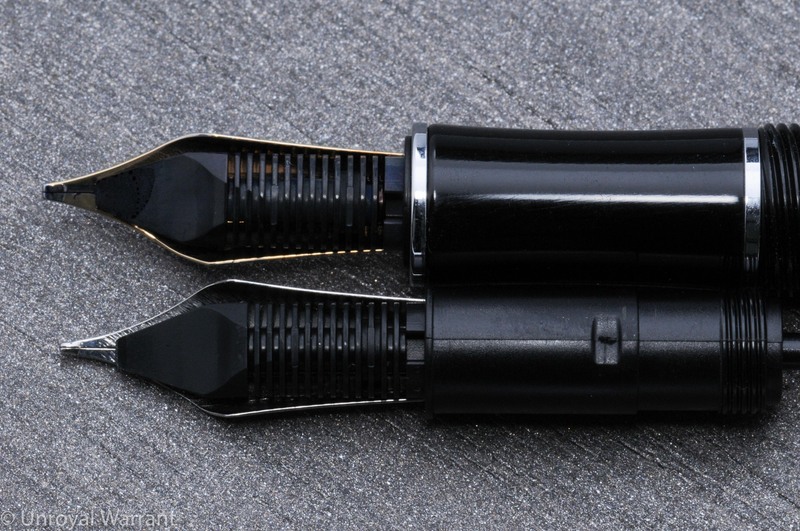 The Lucens and Extra Lucens were the best quality and best looking Italian pens of the 1930s and 1940s. 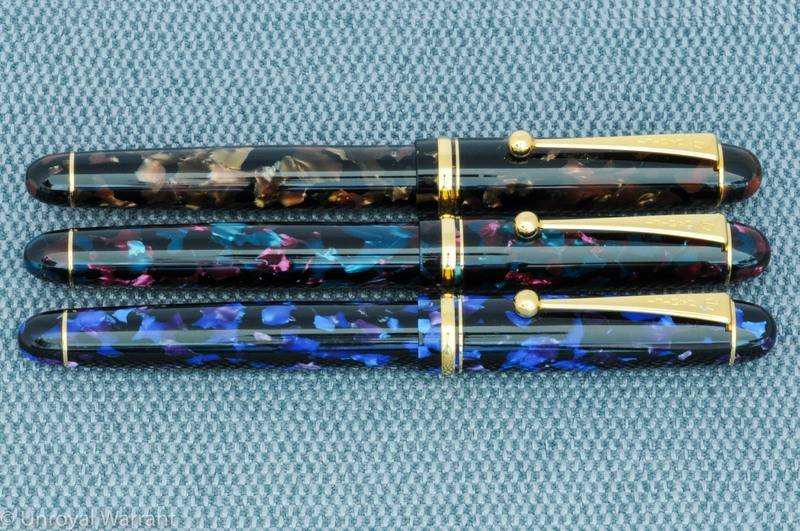 Italian pens during this period were largely inspired (and in many cases copies) of American pens. 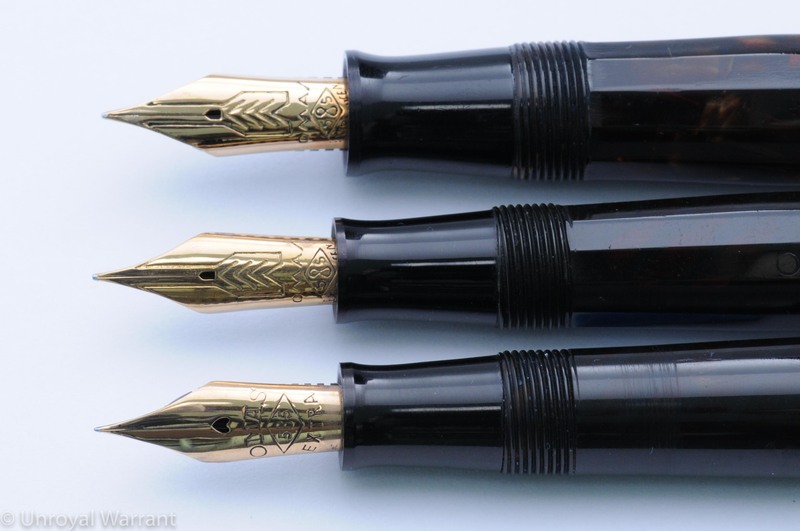 The Lucens and Extra Lucens were offered with visulated barrels much like the Parker Vacumatic and Waterman Ink View. 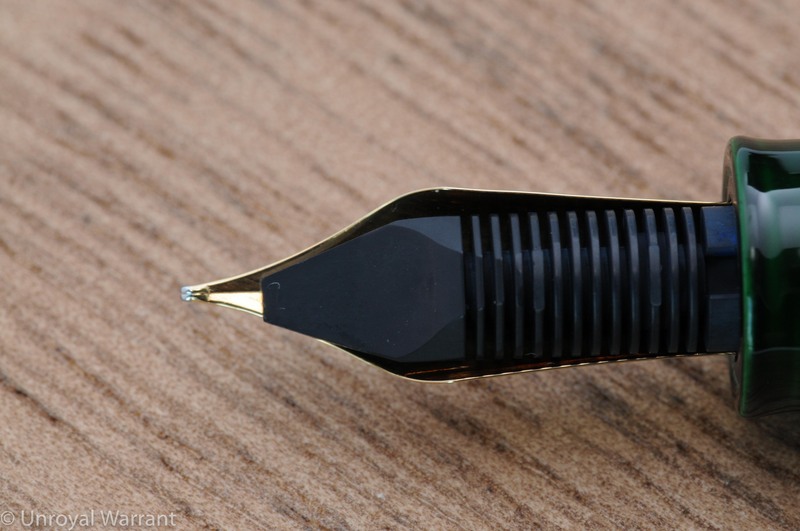 The Extra Lucens also featured an arrow nib and an arrow clip not unlike the one found on the Parker Vacumatic. 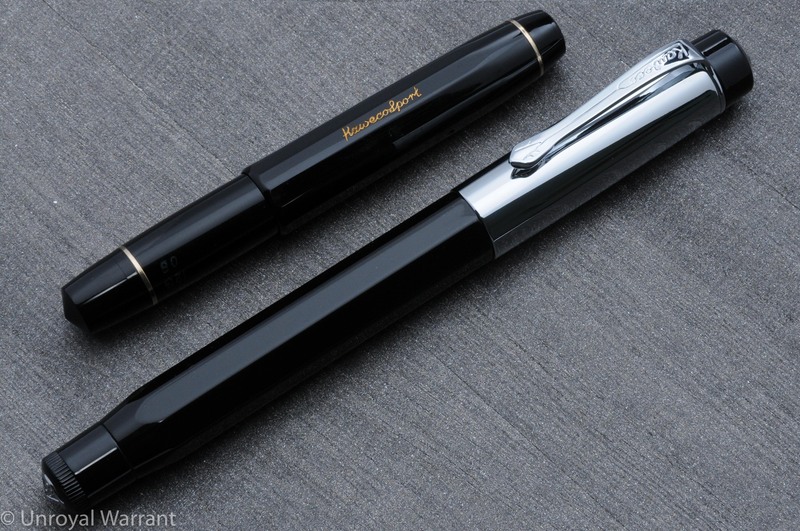 In the late 1930s Wahl Eversharp came out with the Doric, a faceted pen very similar to the Extra Lucens; there is some debate about which pen was introduced first. The bodies were made of celluloid and all of them had a degree of transparency to them. The pens in my photos that appear black (because they are filled with ink) have black striped barrels and were originally clear but have turned into to a red color. 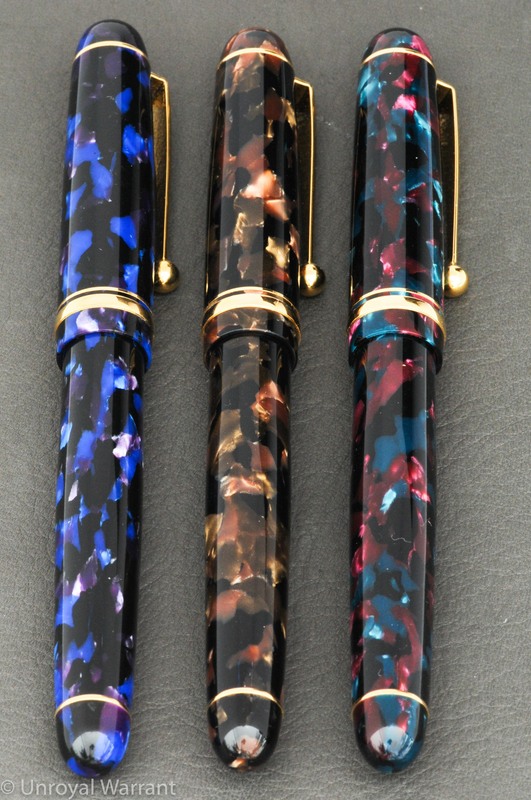 There were a number of beautiful celluloids that these pens were produced in. 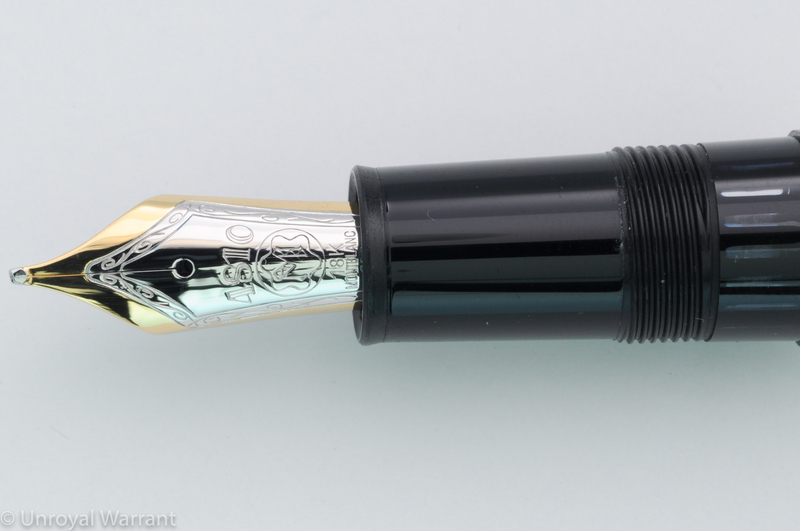 The rarest and most valuable color was a grey pearl (if you Google “OMAS Extra Lucens Limited Edition” you can see a reproduction of this pen, though the original was not brown). Both the Lucens and Extra Lucens use a stantuffo tuffante, or plunger filling system. This system is considered to be the same as the one used by the American brand Dunn, which had a patent on this system in 1920. 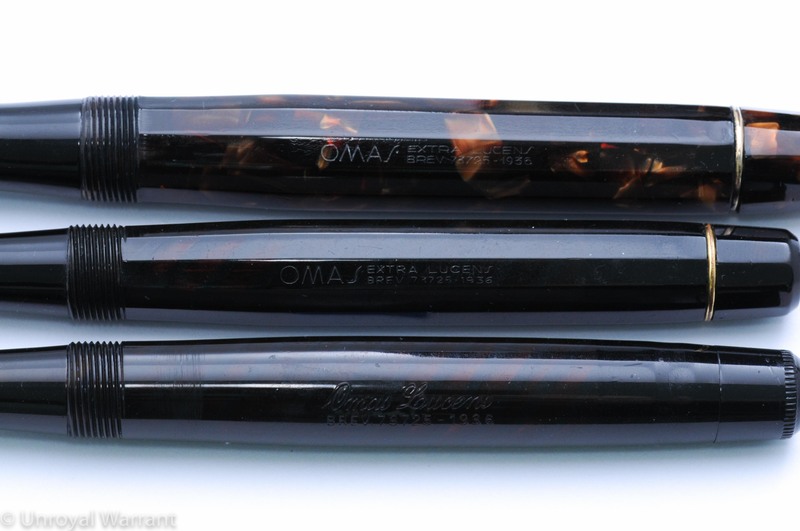 OMAS patented their version in 1936 and for this reason we see “Brev.73725 – 1936” on the barrels of these pens. The plunger filler eliminated the use of sacs which made for a (supposedly) more durable filling system with a larger ink capacity. Personally, I do not like this system and I am not surprised that it was abandoned in favor of the piston filler. Filling the pen requires pulling out the plunger which draws up ink into the pen and then quickly pushing the plunger back down allowing the air to escape through a breather tube inside the barrel…if you push the plunger down too slowly all of the ink you just drew into the pen will be expelled. The filling system is relatively durable such that I feel comfortable using these pens every day. 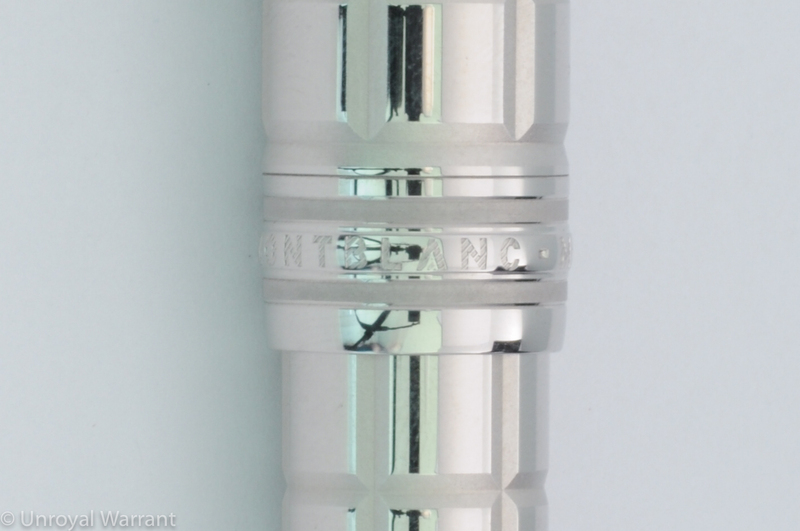 The weak points being a cork seal and breather tube. The Lucens and Extra Lucens came in three sizes, the largest of the three measures about 14cm long capped and the midsize measures about 13cm (unfortunately I don’t have a small one to measure). The larger model is more or less the same size as the current all celluloid OMAS Paragon. 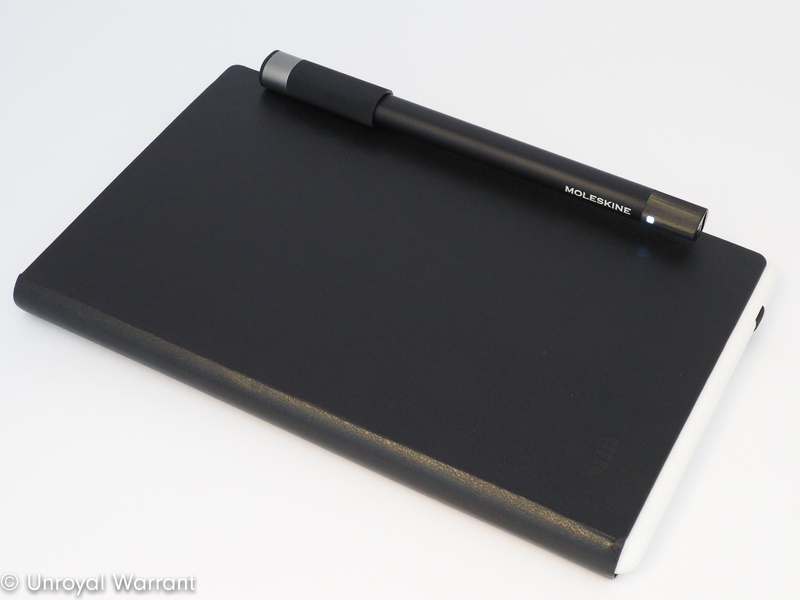 The midsize is very similar in feel to a Pelikan M400 though slightly longer. The nibs of the Lucens and Extra Lucens are quite different. 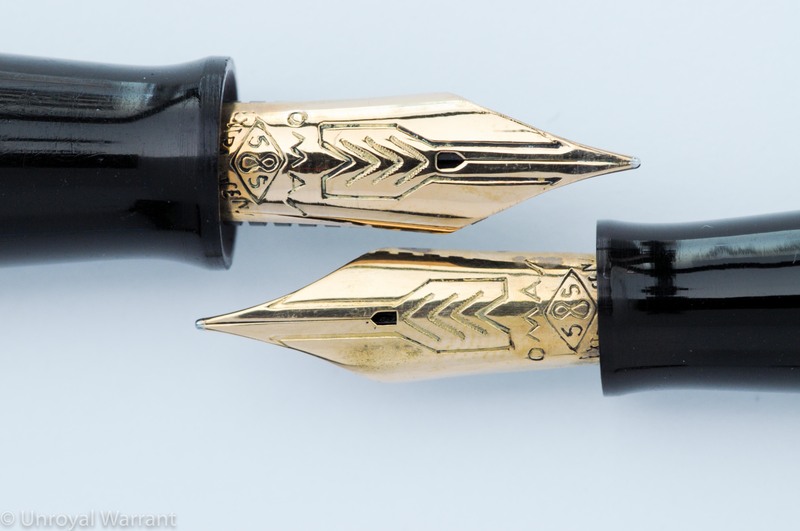 The Lucens “Extra” nib with heart shape breather hole was the standard nib used on all of the OMAS Extra pens, while the Extra Lucens had a special arrow nib with a pentagon shape breather hole. 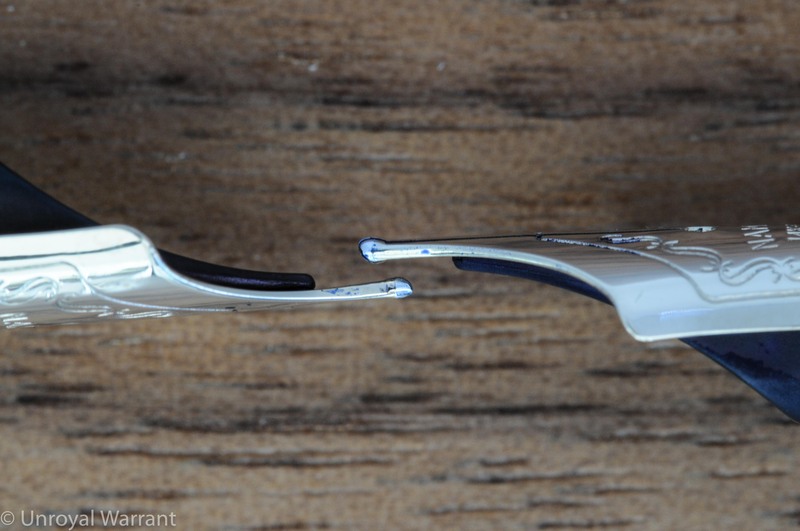 The Extra nib has longer tines than the Extra Lucens nibs creating more flexibility. The Extra Lucens nibs are soft and springing but not flexible (based on the small handful I have sampled). During the war the Lucens and Extra Lucens pens had white metal trim and “permanio” nibs which were made of a steel alloy. 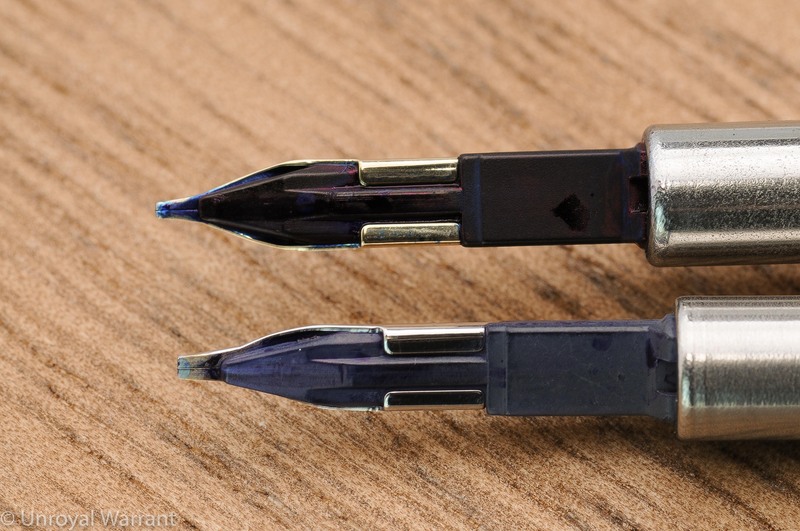 These nibs, unlike Montblanc and Aurora’s wartime nibs, were not very resistant and many of them corroded. 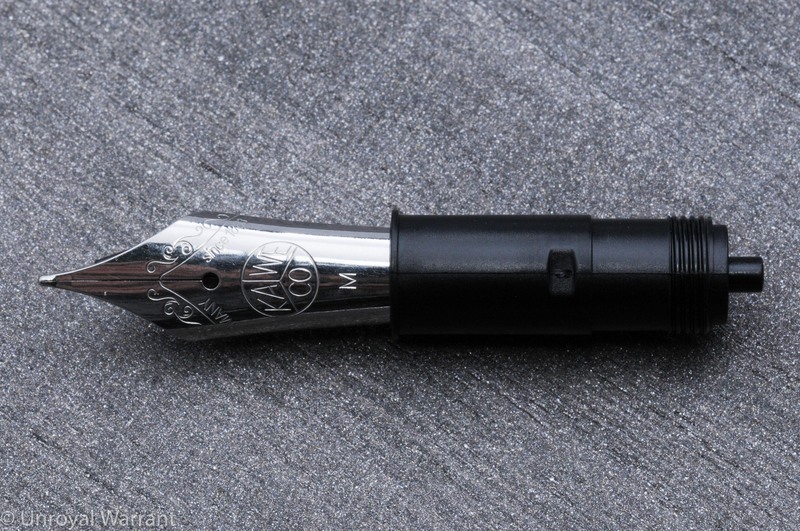 The Extra Lucens was also offered with a bi-tone reversible arrow nib. 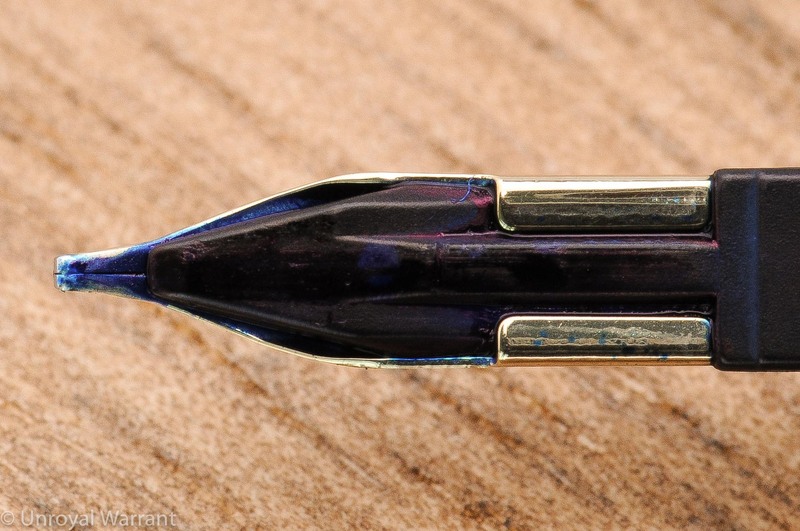 The reverse side was stiff for carbon copies while right-side up the nib was soft like a regular OMAS nib. These pens are very nice reliable writers that I enjoy using. I almost always have one inked up. 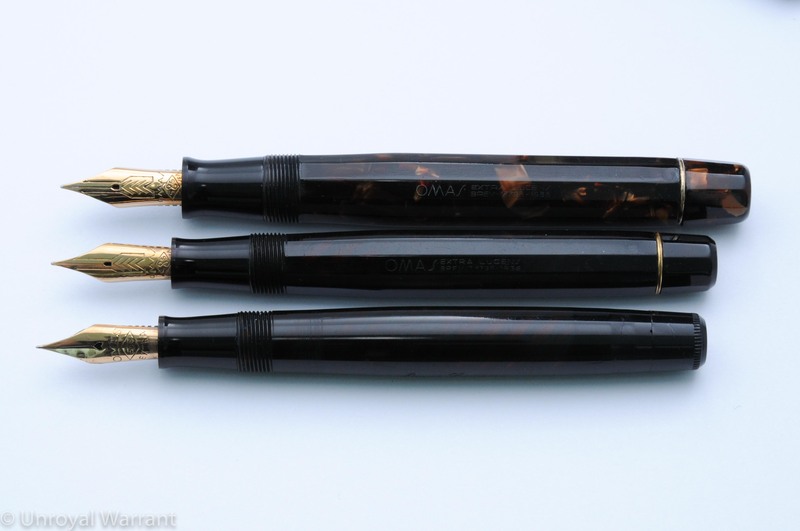 Like most vintage Italian pens, these are relatively rare and expensive. The large size Extra Lucens are the most desirable but for me as writers I prefer to use the smaller models. 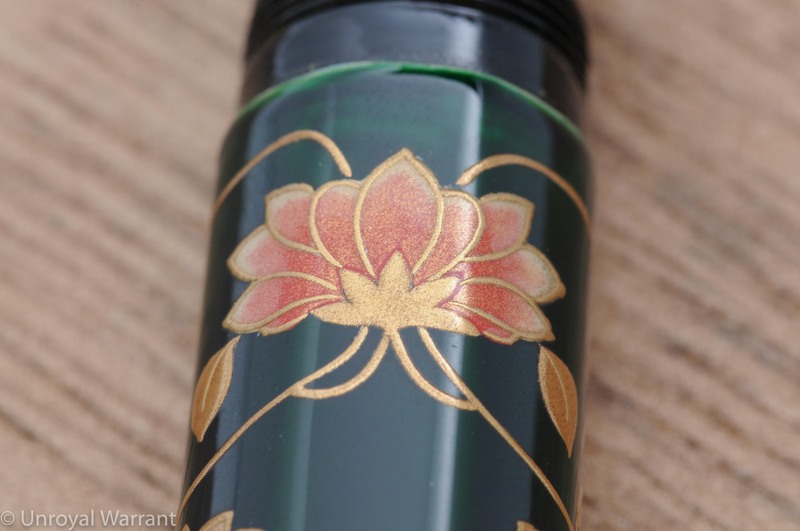 The Namiki Custom Impressions line of pens was produced in the late 90s and while it predates the very popular Pilot Custom 74, it is essentially the same pen with a “celluloid” body and no markings on the cap band. These pens are cellulose acetate and not the cellulose nitrate normally associated with the word “celluloid”. The difference is that the cellulose acetate feels and can often look like a more typical plastic without the depth and oily feel of real celluloid. The Custom Impressions came in five colors: Sapphire, Medley, Ambertone, Ruby and Emerald. I have Sapphire, Medley and Ambertone. It has been suggested (and from what I can tell rightly so) that Aurora used the same green plastic as the Emerald in their Optima. I have photographed them with a couple of Optimas…I am not certain that the Ruby is the same as Aurora’s Burgundy but they are close. I particularly like the Sapphire and Medley colors; these to me are the most unique and beautiful. 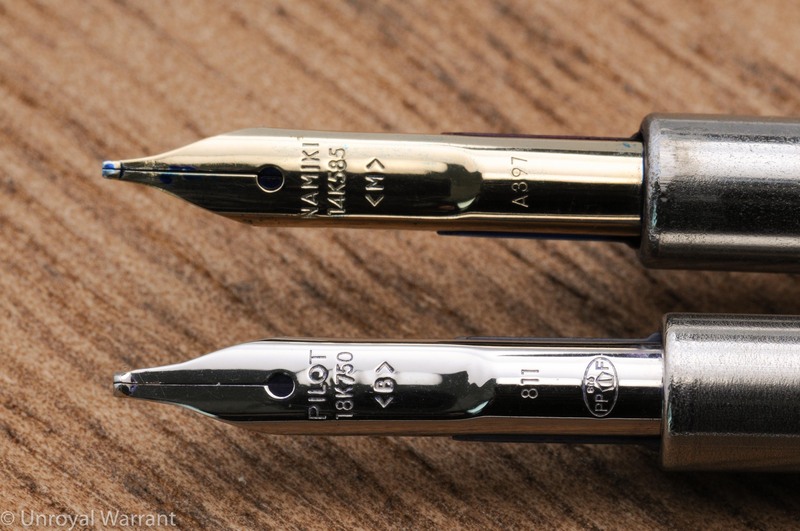 These pens came with a con-70 converter and a 14kt gold #5 nib. 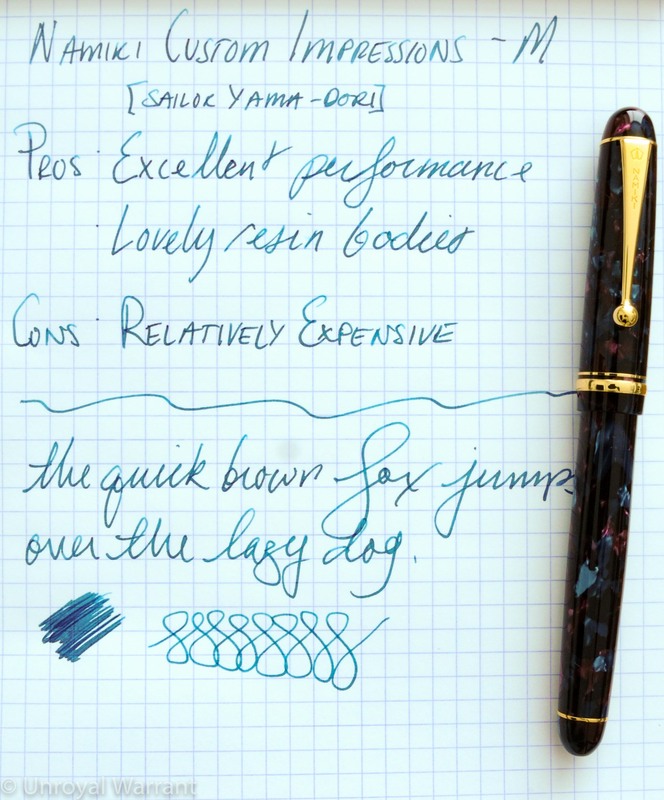 There is another variation of the Custom Impressions that very closely resembles the shape of the Custom 845, but again in “celluloid” and with a #10 instead of #15 nib. 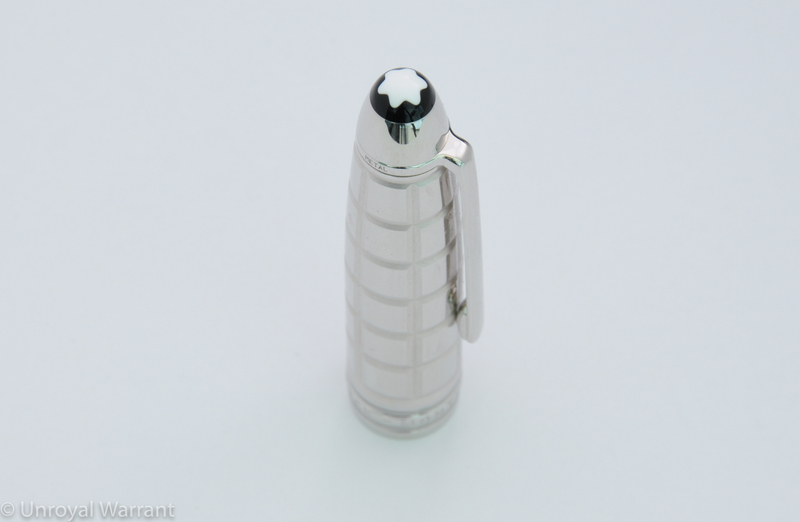 This model seems to be much more scarce and considerably more expensive than the pens I am showing here. 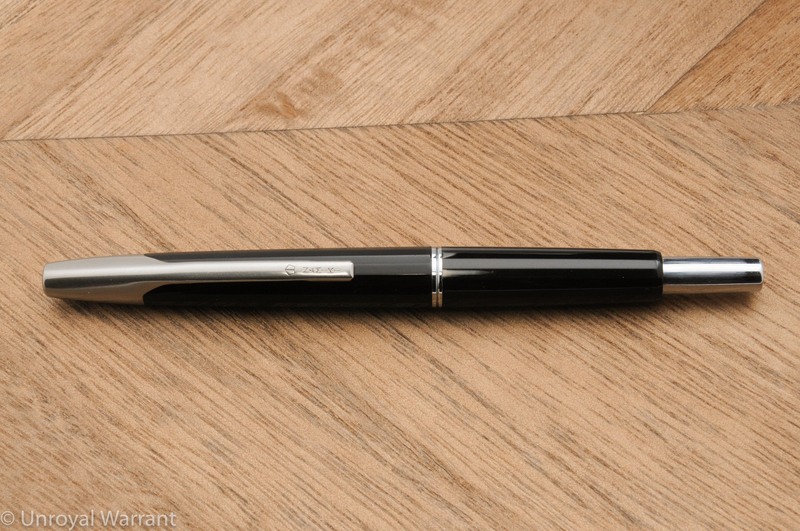 Like the Pilot Custom 74, the Namiki Custom Impressions make excellent workhorses. The nibs are butter smooth and wonderful writers. 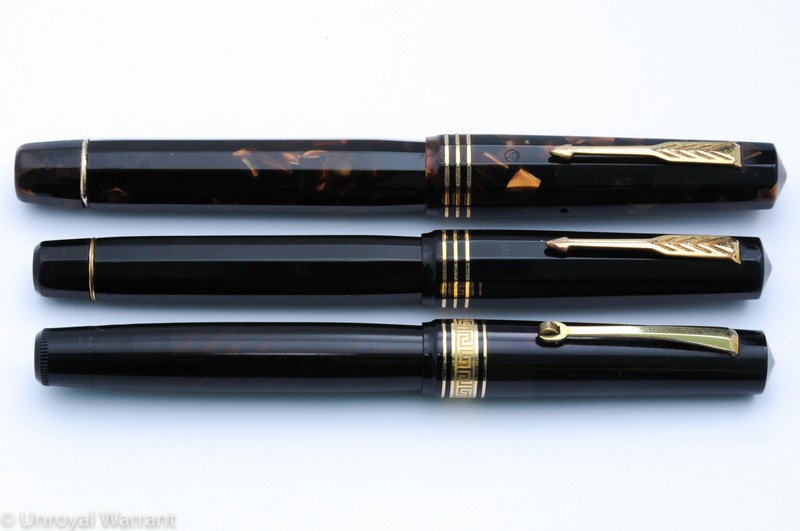 To my knowledge these pens were only produced in fine, medium and broad nib grades. I also find the nibs on the Impressions to be softer than the ones on the Custom 74. It seems to me, based on a small sample of Pilot/Namiki pens, that the pens from the 90s and early 00s have softer nibs than the ones produced more recently. I have a decent amount of experience writing with Pilot/Namiki nibs from size #5 to size #20 and while I find all of these nib sizes to be very comfortable, the #10 seems to hit the sweet spot, with the #5 feeling a bit small and the #15 and #20 feeling a bit big. If you have big hands, which I do not, you may not like the #5 nib on these pens. 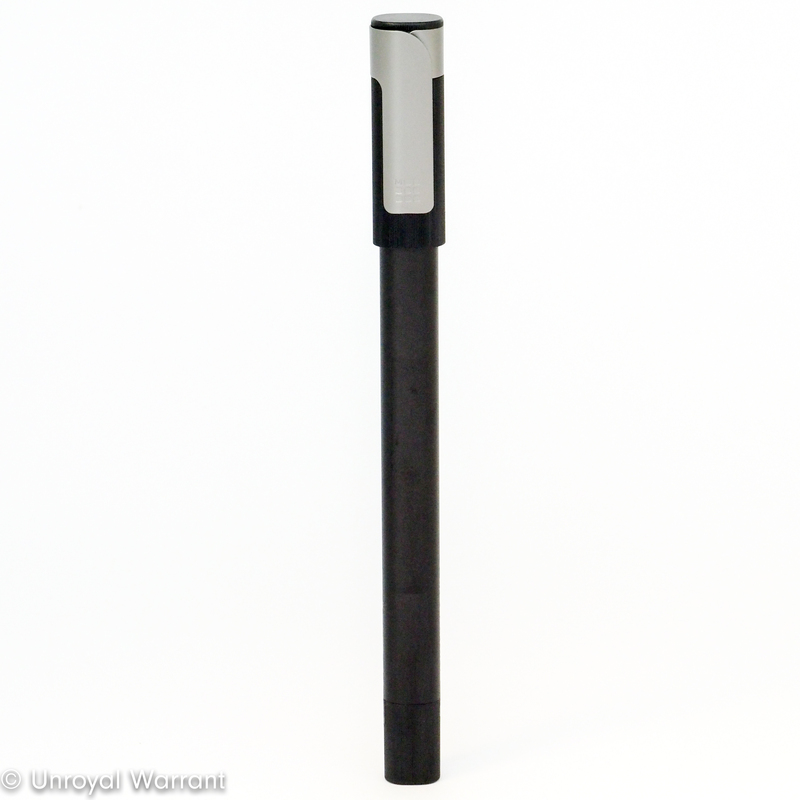 The Custom Impressions are full size pens measuring just over 13.5cm long, capped and weigh approximately 22.5 grams empty (with the con-70 installed). These pens post very well and I find them comfortable to use posted and unposted. Prices for the Custom Impressions range a bit as they do not come up for sale all that often. If you can get one for around $150-$200 (depending on condition) I think that is a fair price but keep in mind if you prefer the look of a simple black body, a Custom 74 can be had for around $90 new. 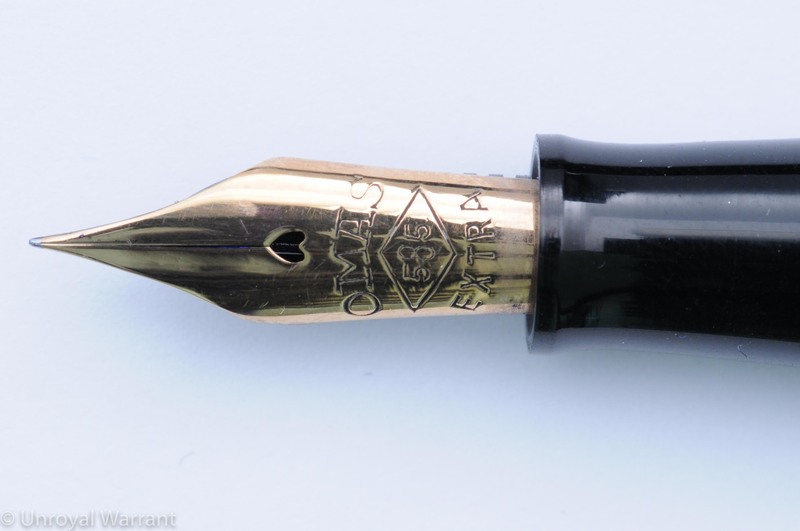 If you read this blog regularly you will know that this pen is not my typical cup of tea but as I was traversing the Warsaw airport I couldn’t help but see sale signs on a large Montblanc display. 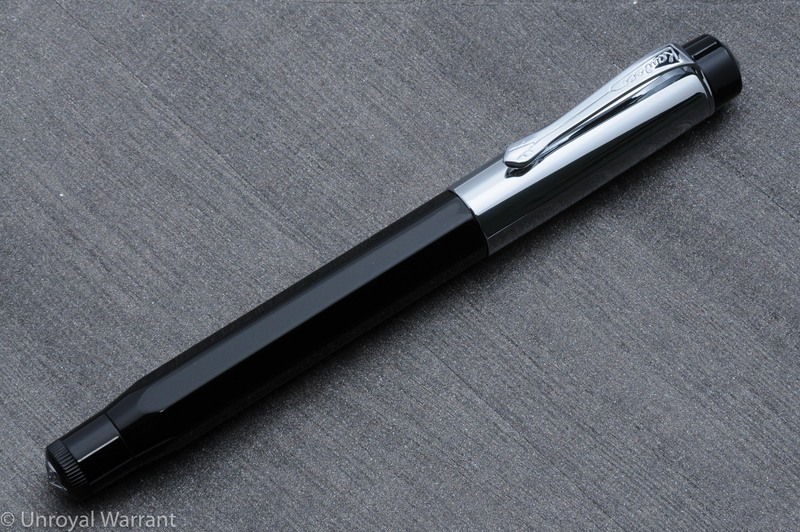 The only pen that caught my eye was the Montblanc Meisterstück Solitaire Platinum-Plated Facet 146 (or LeGrand as they now call it). I was curious to know how much it was and after seeing the price I decided to go for it. 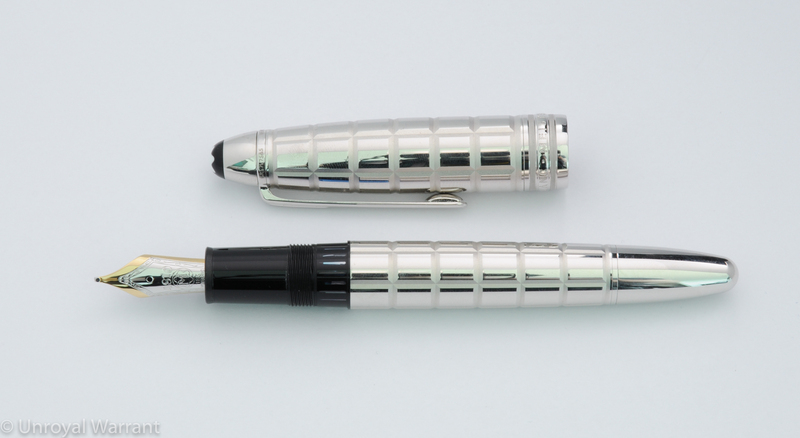 This pen is the typical Meisterstück design but in a faceted platinum plated stainless steel body instead of the usual “precious” resin. 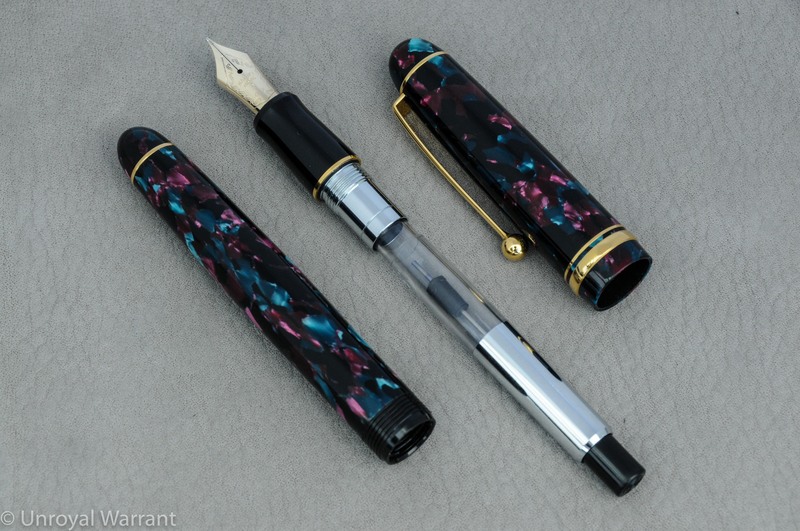 It really is quite a stunning pen to behold and has much more of a presence than its resin sister. The facets create a tiled pattern. 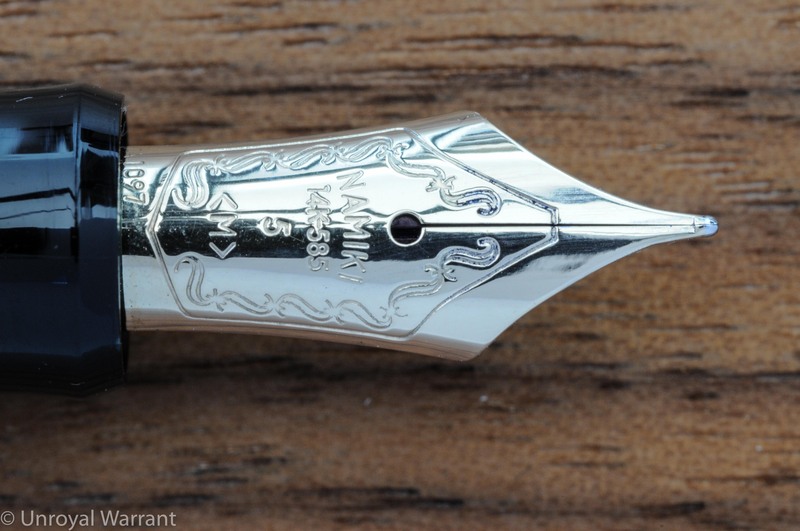 You will notice that the face of the tiles are a mirrored platinum finish while the edges are brushed; this is a particularly nice touch and a testament to the craftsmanship put into this pen. 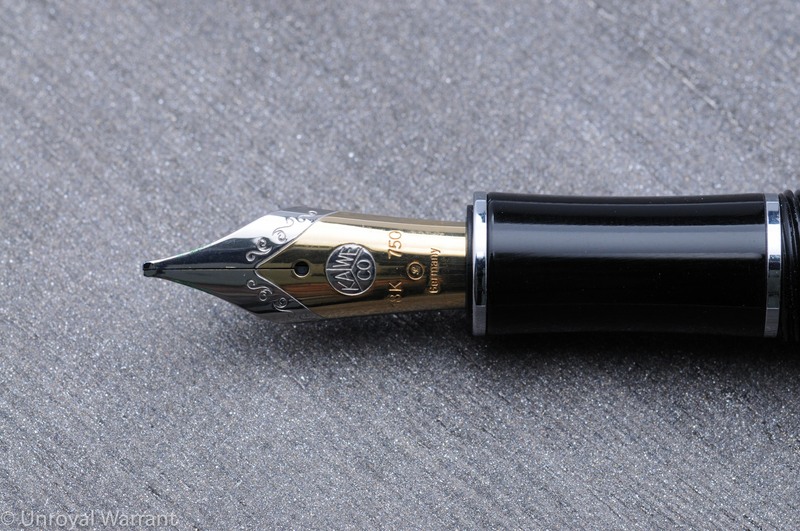 This 146 came with a medium nib which was too fat for my tastes but Montblanc has a free nib exchange program than can be utilized within six months of purchase. At the Montblanc boutique in Berlin I was able to try their tester set and found that the OB nib offered the most line variation and the next morning I picked up my pen with the OB installed. That is exceptional service. 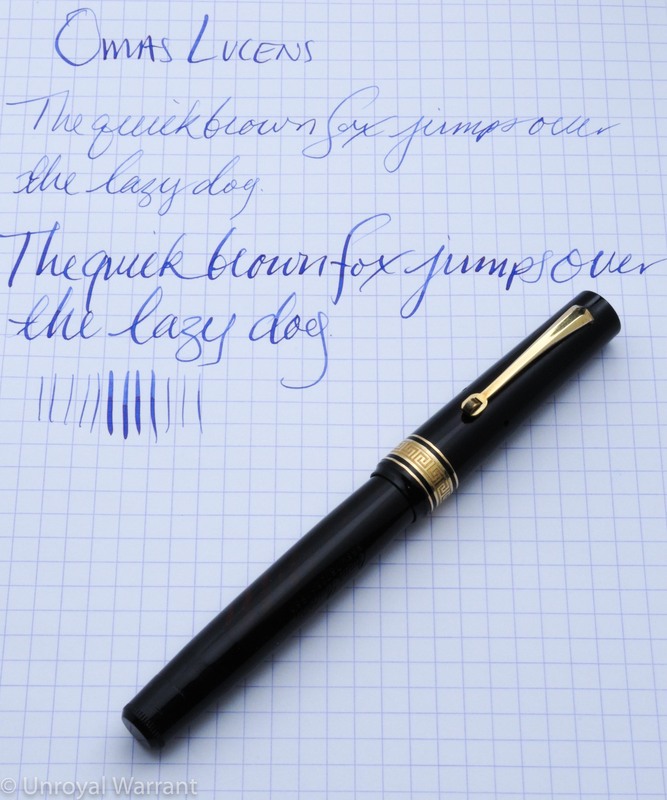 The 146 is a full size pen fitted with an 18kt gold nib, a piston filling mechanism and a striped ink view window. 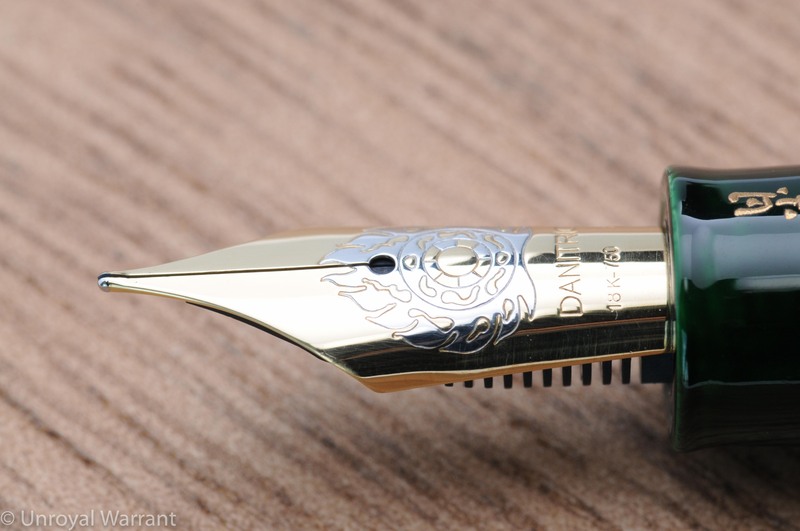 The standard resin 146 has a 14kt gold nib and when compared with the 18kt version I could not tell the difference. 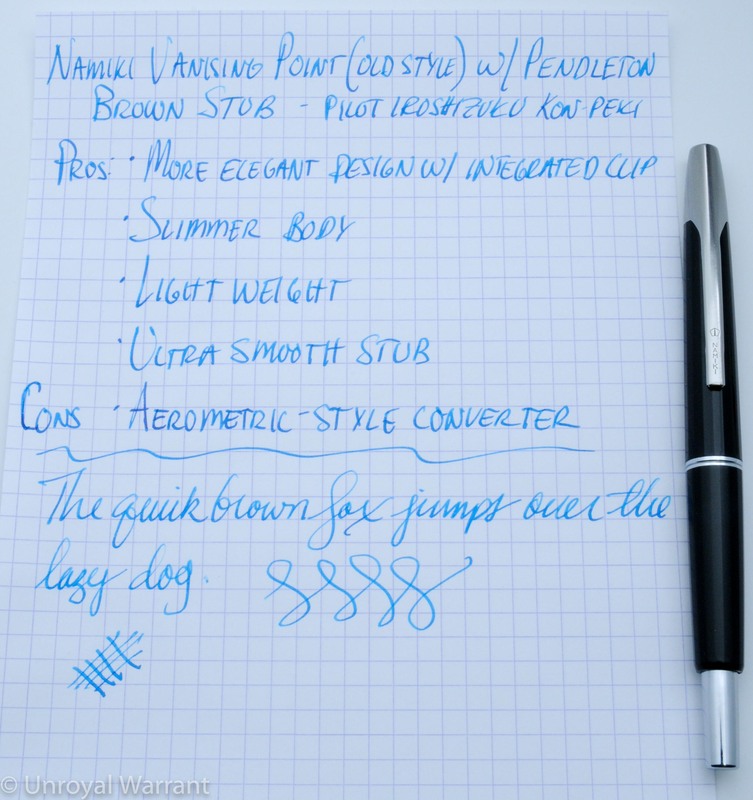 The nib is noticeably soft and is a very nice to use. 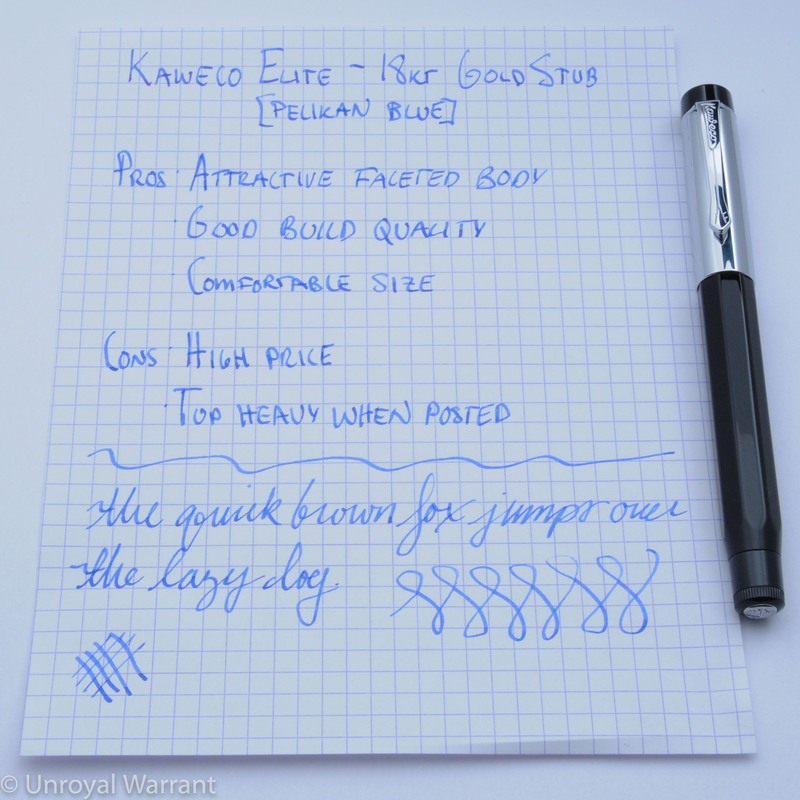 The ink flow is on the drier side but the smooth nib conceals this quite well. I have found that lubricating inks work best with this pen. As is obvious in all of my pictures, this pen is a fingerprint magnet. If you cannot handle finger prints and patina this 146 is a not a good choice. 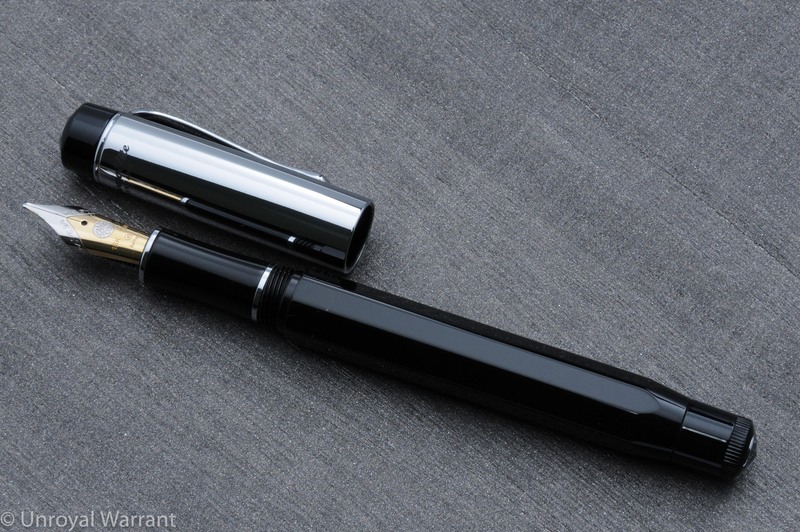 This pen retails for around $1,300 and even at over 50% off I don’t feel as though the price was a home run. 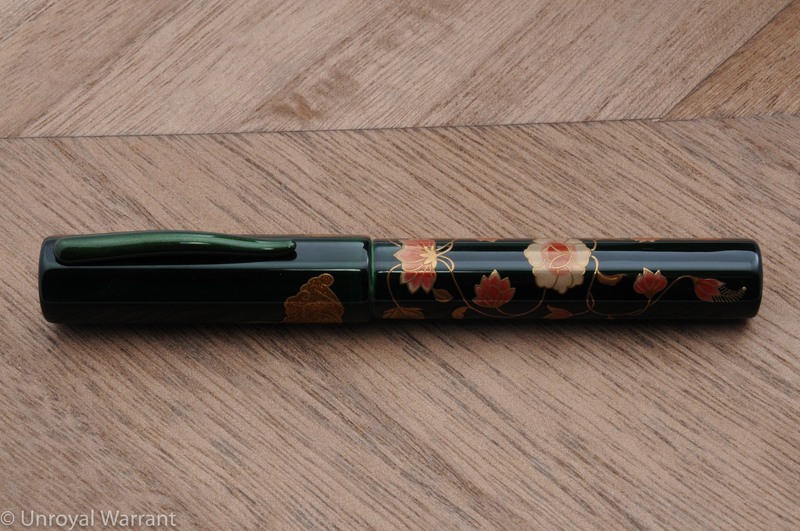 It’s very well made and nice to look at but to me it is not as special as say a hand turned Japanese pen or a pen made of beautiful Italian celluloid (all of which can be hand for a similar price). 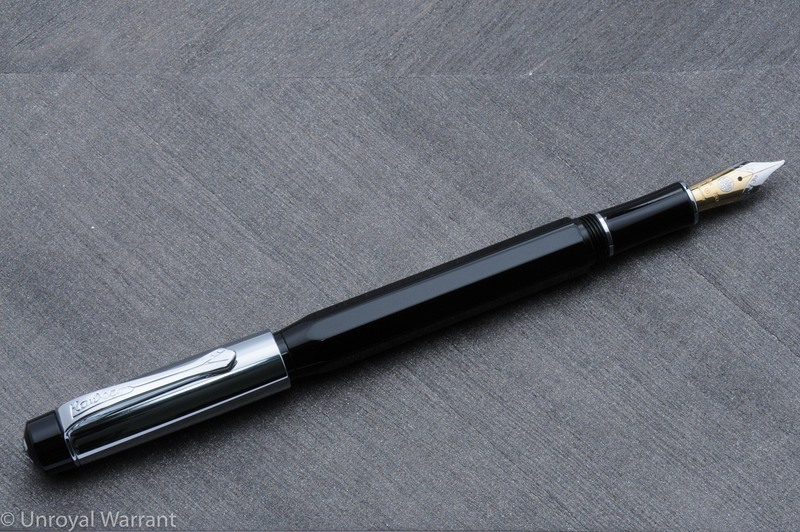 If you want a flashy pen with the Montblanc brand cachet then this could make sense but otherwise at anywhere near retail I say forget it.